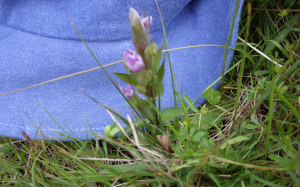 Observation - Field Gentian - UK and Ireland. Description: Found a number of these plants growing on a disused single track road. The most likely identification we can make is Field Gentian - help? Found a number of these plants growing on a disused single track road. The most likely identification we can make is Field Gentian - help?